1. After managing 30 years with no fractured bones, I was finally taken down by a 1 year old girl. Savvy got a little carried away jumping on our oversized ottoman and as she threw herself at me, the side of her giant noggin made contact with the bridge of my nose. I heard two very loud cracks and saw stars. When the nurse asked me what happened, I pointed at my wispy-blonde-haired, bright-blue-eyed, sweet-smiling Savannah Sunshine and said that she was the culprit. Then I added, “It was my own fault, I shouldn’t have asked her where she was last night.” As it turns out, this is not a funny joke to medical professionals. My dad, on the other hand, thought it was hilarious when I said it to him later. You win some you lose some. I ended up with a mild concussion and the x-ray showed my nose is fractured in two places but not severely enough to reset it so I have to wear athletic tape over it for a couple of days while it heals. Oh no! 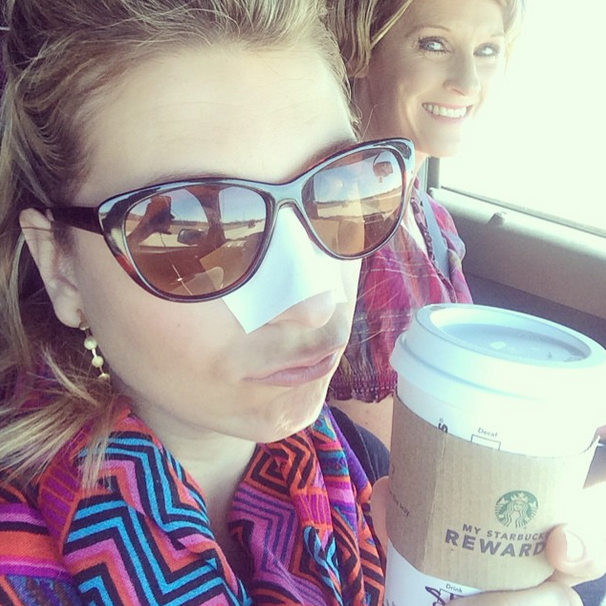 I’m so sorry to hear about your nose- but your ER story is hilarious. Totally reminds me of the time I cut my finger (shattered wine glass- blood AND spilled wine, a travesty) and needed stitches. During the Q&A with the nurse, I answered the “Do you use drugs recreationally?” question with a, “Only on the weekends- what is this, Saturday? Yepppp.” Obviously kidding. My mother was horrified. The hashtag on your picture. Hilarious! Hope your nose heals quickly.